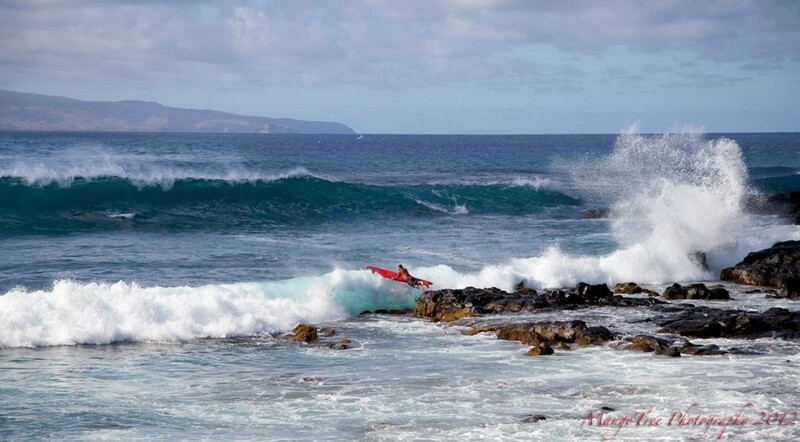 A surfer hits the waves, jumping from the lava rock shoreline at Honolua Bay, Maui into a fall swell with overhead heights. Before experiencing the excitement of riding the wave itself, surfers here sometimes get a preliminary thrill just getting into the water. On big wave days, water broils in to the entry at high speeds and quantities that mean serious business. If you can’t get to over this hurdle, it may be the ocean telling you that you’re not ready for what lies beyond. Typically with waves of this size surfers will grab their short boards or guns (long boards with a lot of rocker and a sharp point on the end) to ride. However, this surfer went with his longboard, which can help him paddle faster but also gives him a lot more board to keep track of as he gets out to the sets. This picture was taken October 27, 2012.